AAICLAS Recruitment 2018: AAI Cargo Logistics & Allied Services Company Limited invites offline application from qualified candidates. Currently it has 372 openings in many locations. Recently it has released the recruitment advertisement for Security Screeners posts. 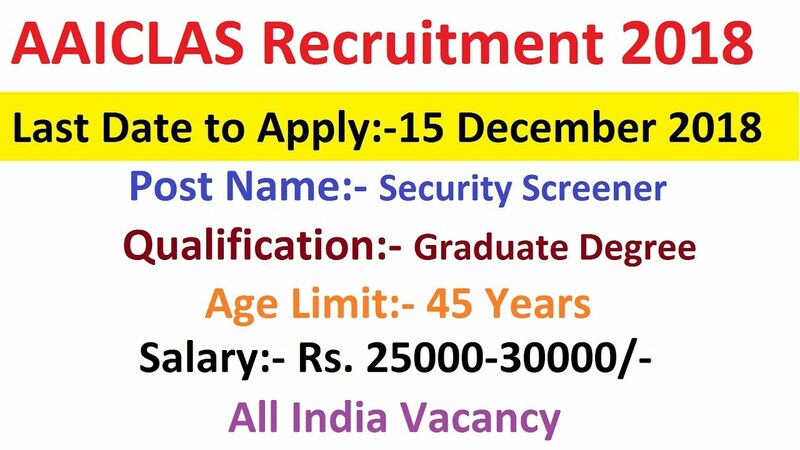 As per the AAICLAS Recruitment 2018 notification, these 372 vacancies are allocated for above said posts. Applicants who have more passion in central govt jobs can use this chance. AAICLAS recruitment application form and notification is available in official website. Interested aspirants should send the filled application form to given address. The last date for receipt of the application is 15.12.2018. Any Graduate from recognized university. Candidate’s upper age limit should be 45 years. AVSEC Candidates: Selection will be based on interview only. Non AVSEC Candidates: Selection will be based on physical endurance test, written test and interview. Rs.500 for all candidates and no fee for SC/ ST/ Female/ EXSM candidates.